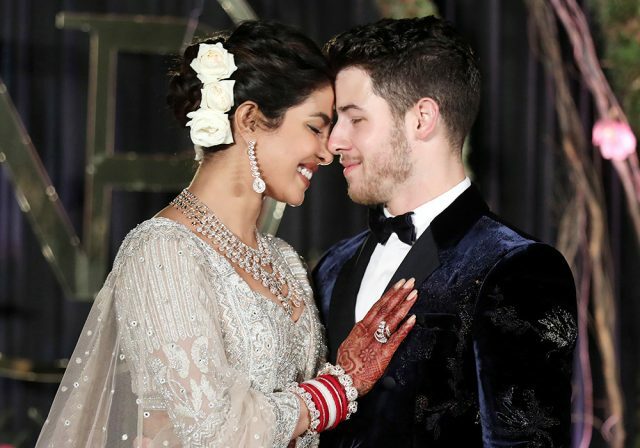 Two days after their lavish wedding, newly-weds Priyanka Chopra and Nick Jonas hosted a reception in Delhi for family and friends. 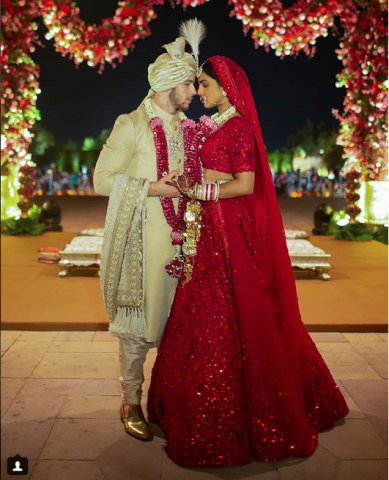 Priyanka looked stunning as she walked on stage with her husband Nick, who looked dapper in his velvet suit. The two posed for the cameras and you could’t miss the joy shining in their eyes. The bride looked ethereal in silver-blush beaded lehenga by Falguni Shane Peacock and custom jewellery by Delhi-based Khanna Jewellers. Priyanka’a designer revealed that it took 12,000 hours — exactly 500 days or over 16 months — and 80 craftsmen to create the custom outfit. Her traditional bespoke ensemble was embedded with crystals and hand-embroidered motifs like elephants, birds, flowers and butterflies from the Jodhpur wedding. Sophie Turner and Joe Jonas also looked fabulous at the event. 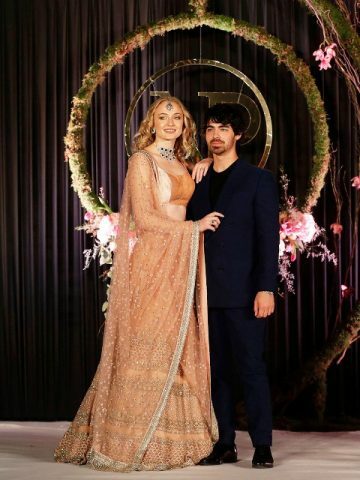 The Game of Thrones star opted for a peach lehenga with gold embellishments by Sabyasachi Mukherjee, Joe kept it simple in a navy blue suit. 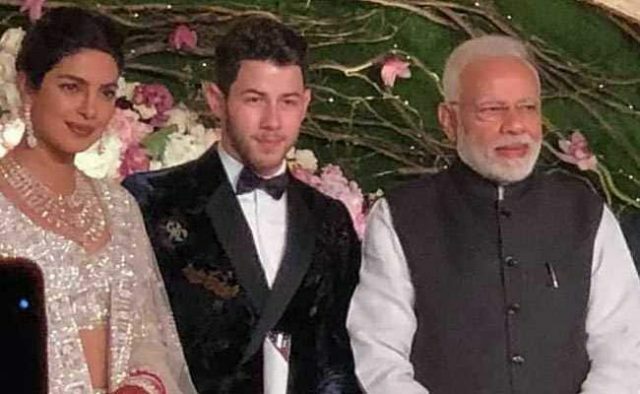 One of the special guests to arrive at the wedding was Indian Prime Minister Narendra Modi. Priyanka’s mother Madhu escorted PM Modi to the stage, where he gifted a rose to each of the newlyweds. The couple will host another reception in Mumbai for Bollywood celebrities. The couple tied the knot on December 1 and 2 at Jodhpur’s Umaid Bhawan Palace. The news came just four months after their engagement in July 2018. Priyanka said “I do” in a custom Ralph Lauren gown with a 75-foot long veil. The dress took 1,826 hours to complete. Jonas also wore a Ralph Lauren tuxedo, and their bridesmaids and groomsmen were also dressed by the house. She was escorted down the aisle by her mother Madhu. Her father Ashok died of cancer in 2013. For her Hindu wedding, Chopra wore a red lehenga by Sabyasachi Mukherji. 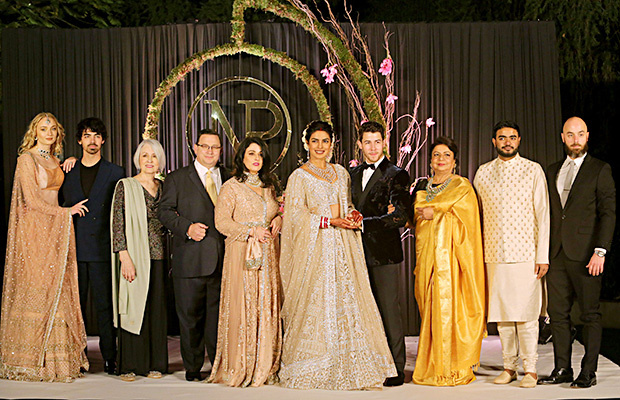 Nick and Priyanka also held an engagement party in India, where their two families met for the first time. It’s unclear what their honeymoon plans are.